From Left: Flomin, Button, and Gonyo. Photo by Alex Escalante. A lot can happen to a dancer over the course of 20 years. Physically speaking, the personal narrative is, for most, an amalgam of classes, auditions, rehearsals, and performances. Emotionally speaking, there is no requisite story – passion and ecstasy come just as easily as depression and contempt. The relentless study of one’s own body, its habits and limits, can feel idiosyncratic, sequestered, and downright neurotic. And yet, this independent experience of self-scrutiny seems to be a pillar of the present-day dance community. Nowadays, it is right and good (and often expected) that we question our place in the field, our worth as an artist, and the sustainability of our lifestyle. How appropriate, then, that choreography can serve as the reflecting pool for such introspection. 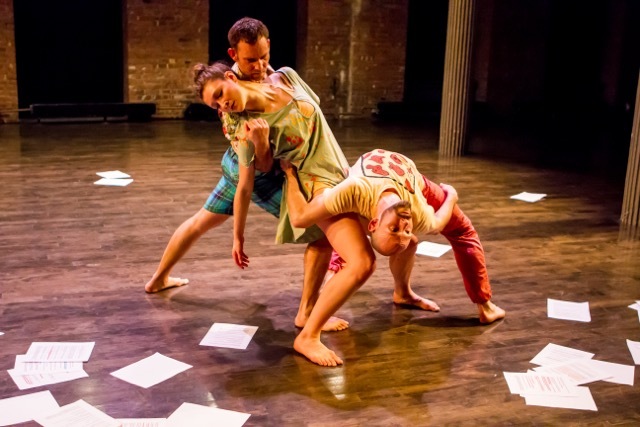 Such is the setting for Ori Flomin’s First Move, an evening-length work that premiered last week at Gibney Dance Center’s new theater space in Lower Manhattan. Having asked over 40 dancers and dance-makers to contribute their stories and experiences about a life in dance to his project, First Move is Flomin’s presentation of these months of research, translated from words into movements. The idea of research here is crucial, and harkens back to the idea of dancers being alone together – is collective wisdom more reliable than personal experience? From left: Gonyo, Flomin, Thomas and Button. Photo by Alex Escalante. Button dances while Flomin and Thomas arrange the questionnaires. Photo by Alex Escalante. 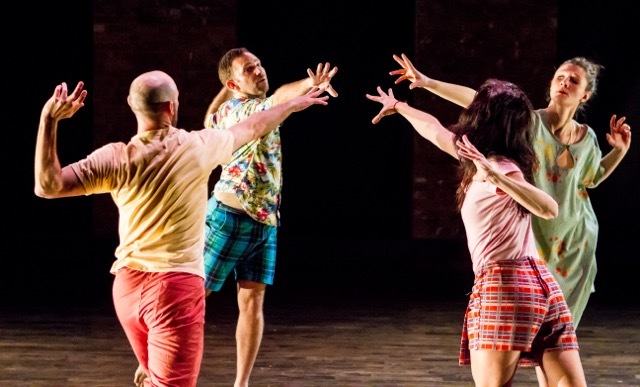 Perhaps these repetitive moments are Flomin’s metaphor for dance itself: it has always been and will always be, passing through history one body at a time. Once this dance, or any dance, has become a part of you, it will never truly leave. 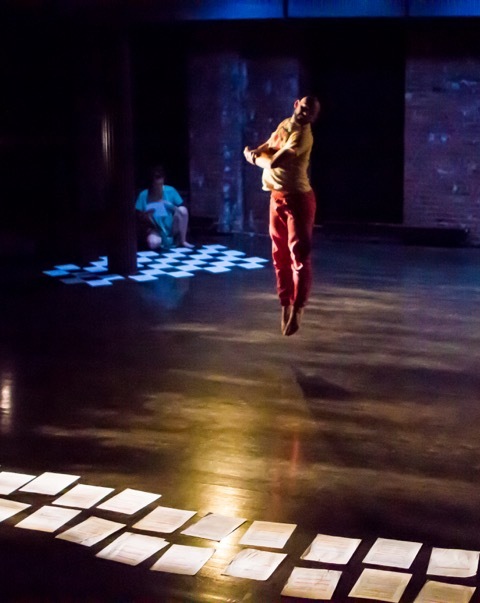 Flomin’s questionnaire data poignantly supports this claim, and his decision to include the responses visually, textually, and aurally in the performance suggests that the physical and emotional memories left by dance are inescapable. Printed on plain white paper, the responses were arranged multiple times around the stage; occasionally, a dancer would read a sentence or two, perhaps about someone’s earliest memory of dancing (holding hands and skipping in a circle and feeling quite proud of the physical feat), or a snippet of advice (“Don’t comment on the movement.”). At one point, we hear, “The best years are when you’re young.” Shortly afterwards, Button (the youngest of the cast) dances an exhausting solo that has her running repeatedly to a downstage corner filled with papers, where she descends, catches herself, then gets up to run again. Even when she is drenched with sweat and heaving for breath, she soldiers on for one more pass. But the most existential expressions came from the poem, also entitled First Move, by Jane Gabriels that was included in Flomin’s program notes and inspired by the questionnaire responses. “Dance chooses me, chose me,” its narrator asserts. “Still. I doubt I am good enough. Still. I cannot NOT dance.” Though these words were likely contributed by a mature dancer, they could just have just as easily come from a high school student. Dance seems to have this effect on people, regardless of generation or location. There will always be doubt, obsession with the things one used to be able to do, and an inkling of common sense trying to kick these two out and make way for new ideas. But above it all is the thing itself, Dance (it might as well be one of Plato’s forms), that is so dearly loved, so pervasive in the spirit, that the memory of its charms will never fade away for Dance’s chosen few. Gonyo performs an athletic solo. Photo by Alex Escalante. At times, the cyclic quality of the work creates a mesmerizing time warp, evoking cultural heirlooms from the 1980s and 90s. Pierre de Gaillande and Gary Greenblatt’s original soundscore fluctuates between pop music synth sweeps, high flying fanfares in the style of John Williams, and seedy lounge sounds that could have come straight from an episode of “Twin Peaks.” A plaid skort for Thomas and a screen-printed tee for Gonyo simultaneously suggest youth and a reluctance to let go of one’s younger years. Still, the performance is not immature. The dancers move with the easy confidence of experience that says they know exactly what they are doing, they have done this all before. Though First Move encourages the feeling of being caught up and swept away, by the end of the work it is clear that there is a second part to that process – being found, returning to base, maintaining homeostasis. It’s a comforting realization, and maybe even explains that sense of the dance community being alone together: no matter how we feel about our work today, someone else has felt this way before, too. We look to them for support and guidance, until we become the advisor. For as much as dance likes be a disrupting force, it is still an agent of stability. It all just depends where you are on the spiral. 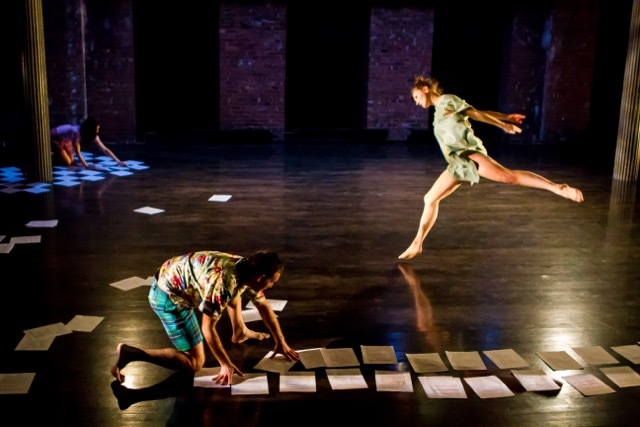 First Move is part of Gibney Dance Center’s “Making Space” program, celebrating the Agnes Varis Performing Arts Center’s inaugural Spring 2015 season. “Making Space” performances continue through June; visit the program website for information on upcoming presentations.